Lessons in traditional Shona mbira music of Zimbabwe are now available anywhere in the world. Erica Azim, who has played Shona mbira music for over 40 years, and taught mbira to thousands, is offering mbira lessons over Skype and FaceTime in any tuning. The photo above shows what you will see filling the screen of your computer or tablet (your phone may be too small to see well). Wherever you are located, have an mbira lesson with an experienced teacher. Individual private lesson, going at your own pace, learning material appropriate for you. Have a lesson in the tuning of YOUR mbira (a variety of options are available). Get feedback from the teacher on your playing. After your lesson, you will be emailed a short audio recording of what you learned. However, you may NOT video-record your lesson. You can always video yourself playing after the lesson. The student and teacher cannot play the kushaura and kutsinhira parts together, so come to an MBIRA Camp or weekend workshop to work on that. What do I need to have a Skype or FaceTime mbira lesson? 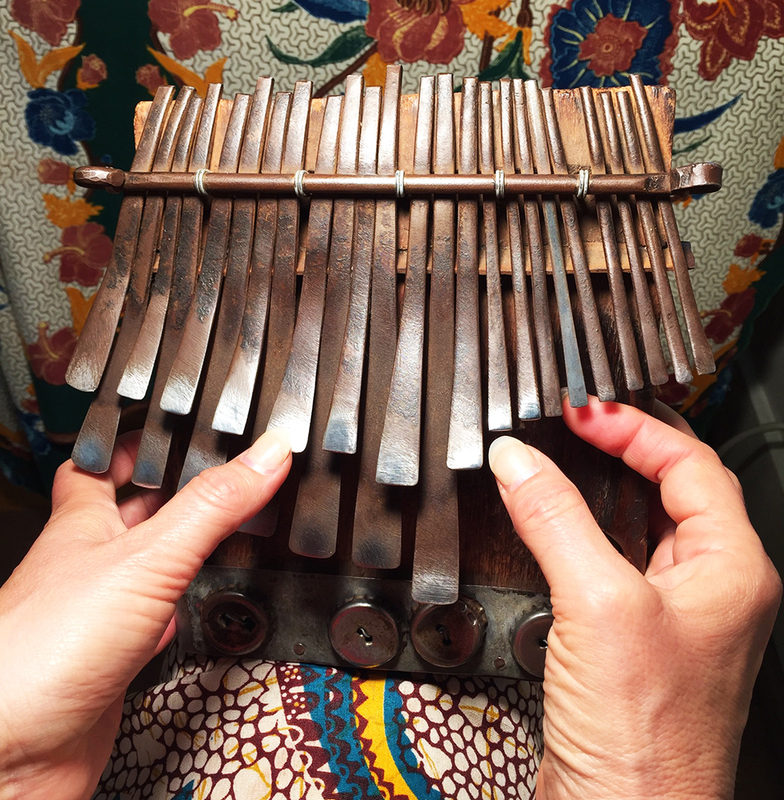 A computer, laptop, iPad or tablet with Skype or FaceTime (free apps) – you will see Erica’s mbira and hands filling most of your screen. First submit the Skype Mbira Lesson Enrollment Form, with or without payment. If using Skype, send a text from Skype to Erica Azim (not the one with my photo, which is no longer working) before the lesson. Erica will call you on Skype at the lesson time. If using FaceTime from an iPad or Mac computer, Erica will give you her cell number to call with FaceTime when it’s your lesson time. Contact us to schedule either a regular lesson time (once a week, once every 2 weeks, once a month, etc. ), or a single lesson. Before your first lesson, if you did not pay when submitting the enrollment form, pay the invoice that Erica will send you via Paypal, with a credit or debit card, or Paypal account. Lessons are one hour long, you will be taught for 55 minutes, then Erica will make an audio recording of all you learned and email it to you during the final 5 minutes.